Make the Adirondack Carousel a Reality! Help us build a year-round 3,500 sq. ft. pavilion that will house a full size-carousel, art gallery and workshop/classroom space, and include the construction of an adjacent playground. Mission: To build and maintain a handcrafted Carousel featuring 24 wildlife figures and a handicap-accessible chariot to be housed in a year-round pavilion with space for programs and special events. Vision: To foster imagination and strengthen our community by providing a responsible means of economic growth for the region through art, education and entertainment. 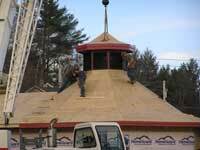 The Adirondack Carousel Inc. was formed to build a community carousel with community hands. We are located in the Village of Saranac Lake in the heart of the Adirondack Mountains. Our carousel will be filled with indigenous animals decked out in local flora and fauna. Our goal is to blend traditional Adirondack flavor with the imagination of a traditional carousel. In the past year, we have become a Not-for-Profit and built a framework of support from town officials to school children. We have been granted the lease of a park in the downtown area on which we plan to build a log camp style building to house the Carousel. We currently have just under $100,000 in our bank account, about one third of the final price tag, and a part-time employee. So we are on our way, but we need help both financially and with carving. Our biggest challenge is completing traditional carved animals. 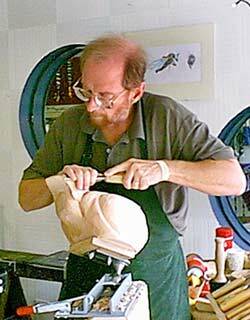 Because we are a small community of approximately 6000 year round residents, we need help in carving our animals. We hope to carve about one third of the animals locally and farm-out two thirds. We will provide the blue prints that will be sent out along with the design and, if needed, blanks to the carving groups. 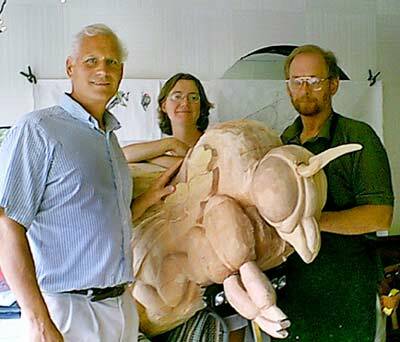 We will also considering individual carvers who can show they have the skill required to complete the animal. We are a small tourist-based town. The Carousel will provide another draw for our visitors. There are few places in the world where families can come to enjoy simple pleasures like walking in wild forests, canoeing on pristine lakes and enjoying a small villages art galleries. We believe the Carousel will add to the responsible development of our tourist trade without losing the character of the local area. But we believe if you just stop to imagine a child hugging a raccoon, or a grandfather riding that big trout that got away when he was a youngster, or a giant black fly that has finally been tamed, you will understand our dream. The Carousel has provided and will continue to provide opportunities in the forms of workshops for the community to practice traditional arts such as woodcarving, painting, gold leafing, twig work and timber framing as well a variety of other skills. We are committed to bringing in skilled instructors to the area to teach all the arts that the complete carousel will encompass. The Carousel will be a place where school children can learn about the local environment and use the Carousel animals trappings to build an understanding of the local flora and fauna. 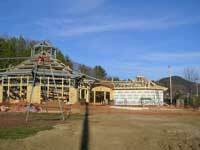 We plan on making the carousel an enjoyable learning place for the children. We also plan on having free rides for all graduation days. We are a community that believes in community. Pease call, write, or email if you have any questions or have an idea to help us reach our goal. We are building a place where new memories will grow and smiles will abound and we hope you would like to be a part of our dream.